Nitric oxide (NO), carbon monoxide (CO) and hydrogen sulfide (H2S) are lipid-soluble, endogenously produced gaseous messenger molecules collectively known as gasotransmitters. Over the last several decades, gasotransmitters have emerged as potent cytoprotective mediators in various models of tissue and cellular injury. Specifically, when used at physiological levels, the exogenous and endogenous manipulation of these three gases has been shown to modulate ischemia/reperfusion injury by inducing a number of cytoprotective mechanisms including: induction of vasodilatation, inhibition of apoptosis, modulation of mitochondrial respiration, induction of antioxidants, and inhibition of inflammation. However, while the actions are similar, there are some differences in the mechanisms by which these gasotransmitters induce these effects and the regulatory actions of the enzyme systems can vary depending upon the gas being investigated. Furthermore, there does appear to be some crosstalk between the gases, which can provide synergistic effects and additional regulatory effects. This review article will discuss several models and mechanisms of gas-mediated cytoprotection, as well as provide a brief discussion on the complex interactions between the gasotransmitter systems. Nitric oxide (NO), carbon monoxide (CO) and hydrogen sulfide (H2S) are lipid-soluble, endogenously-produced gaseous messenger molecules . Together, they make up the family of labile biological mediators termed gasotransmitters. Historically, these gases were considered to be highly toxic and hazardous to the environment. However, it was found that under normal physiological conditions in mammals these molecules are enzymatically regulated and endogenously produced. Because of this discovery, the biological and physiological role of these gases has been re-evaluated. As such, an extensive amount of work has been conducted over the last several decades (last three centuries for NO) and has led to the discovery that each gasotransmitter possess a number of physiological actions. The gasotransmitters have also been extensively studied in several models of cellular and tissue injury. This work has led to the discovery that gasotransmitters and the enzymes that generate them share similar features and overlap in a variety of biological functions. Specifically, studies have found that deficiencies in the enzymes (through genetic manipulation or use of inhibitors) exacerbate ischemia-reperfusion (I/R) injury, whereas genetic overexpression of the enzymes induces cytoprotection. Furthermore, treatment with pharmacological donors or inhaled gas therapy has also been shown to provide cytoprotection. This review article will discuss the physiological significance and the fundamental mechanisms by which these gaseous molecules exert cytoprotection in several models of tissue and cellular injury, as well as provide a brief discussion on the complex interactions between the gasotransmitter systems. NO was the first gasotransmitter to be identified by studies dating back to the late 1700's, which investigated its pharmacological efficacy . However, it was not until 1867 that evidence emerged to suggest that NO induced vasodilatory effects in patients suffering from angina pectoris . Unfortunately, it's true potential and physiological significance in the field of medicine was not discovered until the 1980's, when scientists Furchgott and Zawadzki identified NO as an endogenous modulator of vascular tone . NO levels are controlled at the level of synthesis, initiated by the interaction of nitric oxide synthases (NOSs) and calcium-calmodulin stimulation. 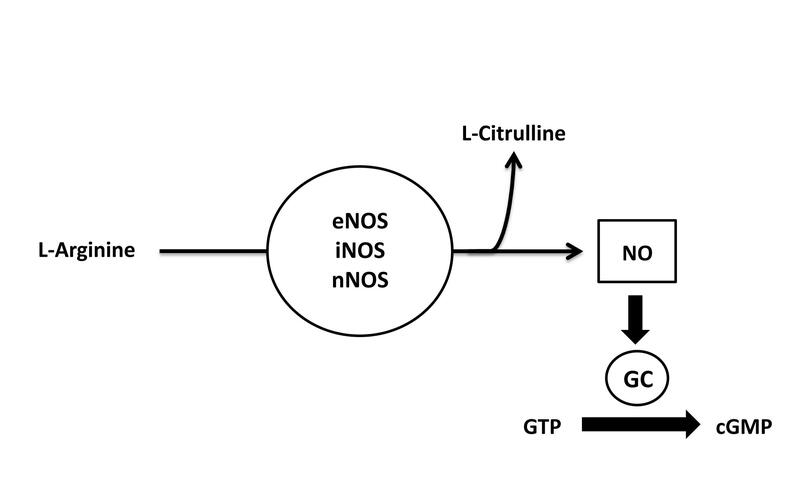 There are three isoforms of NOS that have been characterized, purified, and cloned: the endothelial isoform (eNOS), the neuronal isoform (nNOS), and the inducible isoform (iNOS). These enzymes generate NO from the guanidine nitrogen of the amino acid L-arginine in the presence of oxygen and NADPH, while forming L-citrulline as a byproduct (Figure 1). NO released from the endothelium enters the target cell and initiates cGMP-dependent protein kinase phosphorylation of myosin, by activating the cytosolic enzyme soluble guanylyl cylase causing a subsequent increase in the intracellular concentration of cyclic GMP (cGMP), which then goes on to regulate smooth muscle relaxation and vasodilatation. Enzymatic Synthesis of Nitric Oxide. Nitric oxide (NO) is produced from amino acid L-arginine by the enzymatic action of nitric oxide synthase (NOS). There are there forms of NOS: endothelial NOS (eNOS), neuronal NOS (nNOS), and inducible NOS (iNOS). NO activates guanylate cyclase (GC), which leads to increased production of 3',5'-monophosphate (cGMP). The endogenous source of CO was first identified in 1969 when it was determined that it is derived from the breakdown of heme by the enzyme heme oxygenase (HO) (Figure 2) . In 1993, a study investigating nonadrenergic/noncholinergic (NANC) neurotransmission in the enteric nervous system identified CO as a vasorelaxant and later confirmed it as the second gasotransmitter [6, 7]. Molecular cloning has revealed three known isoforms of heme oxygenase: inducible HO-1 a ubiquitously expressed transcription factor activator that is crucial in oxidative stress response; HO-2 which is constitutively active and controlled by posttranslational modification ; and HO-3 which is similar to HO-2 but considered a less efficient heme catalyst . Similar to NO, CO has been shown to modulate vasorelaxation, vascular smooth muscle cell growth, and tissue injury through elevation of cGMP levels, it is also suggested that local effects of CO may directly influence NO release, and furthermore stimulate adaptive responses and augment gene expression [10, 11]. Enzymatic Synthesis of Carbon Monoxide. 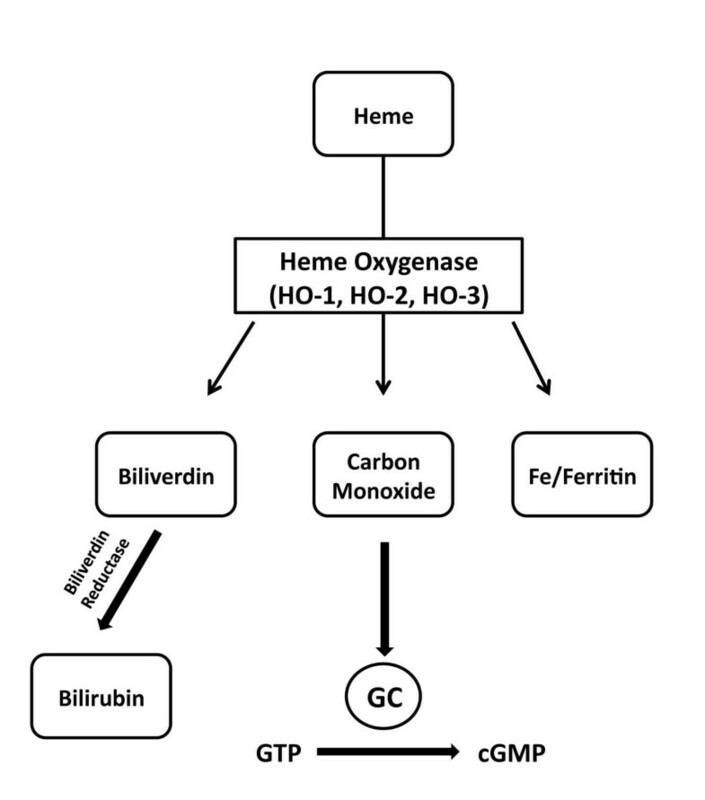 Heme is catabolised by heme oxygenases (HO), to form biliverdin, carbon monoxide, and iron. Carbon monoxide can activate soluble guanylyl cyclase, which causes an increase in cyclic guanosine monophosphate levels (cGMP). Biliverdin is subsequently converted to bilirubin by biliverdin reductase. H2S was the third endogenously produced gasotransmitter to be identified. 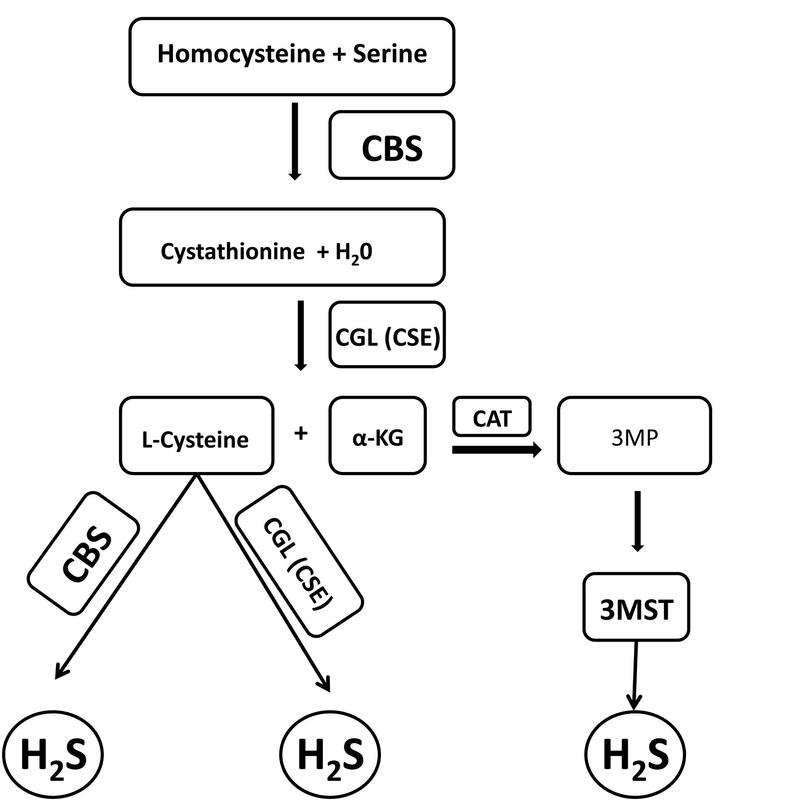 The production of H2S in mammalian systems has been attributed to three principal enzymes (Figure 3): cystathionine β-synthase (CBS), cystathionine γ-lyase (CSE or CGL) and 3-metacaptopyruvate sulfur transferase (3MST). The endogenous production of H2S was initially described in the brain and attributed to CBS activity . However, recent studies have found that ~90% of total H2S production in the brain is attributed to 3MST . CBS and CGL are found in all tissues; however CBS is the predominant source of H2S in the central nervous system (CNS), whereas CGL is the predominant source in the cardiovascular system. Perhaps the most characterized physiological action of H2S is its participation in memory formation as a central component of the process of long-term-potentiation of neuronal circuitry . Additionally, like NO and CO, H2S also mediates smooth muscle relaxation and vasodilation. However, it does so in a guanylyl cyclase/cGMP independent manner [14, 15]. Enzymatic Synthesis of Hydrogen Sulfide. There are three enzymatic pathways involved in the synthesis of hydrogen sulfide (H2S) in mammalian systems. Cystathionine β-synthase (CBS) produces H2S through a reaction involving the generation of cystathionine from homocysteine and L-cysteine from cystathione. Cystathionine γ-lyase (CGL or CSE) produces H2S through a reaction involving the generation of L-cysteine from cystathionine. 3-mercaptopyruvate sulfur transferase (3MST) produces H2S through a reaction involving the generation of 3-mercaptopyruvate (3MP) from α-ketoglutarate (α-KG) by cysteine aminotransferase (CAT). A unique characteristic of gasotransmitters is that they lack conventional regulatory mechanisms, as they have the ability to pass messages directly to an intracellular target without the need for receptor or plasma membrane interactions . This makes the gasotransmitters particularly attractive candidates for the treatment of pathological disorders, such as I/R injury. Over the past several decades, studies using animal models and clinical investigations have defined these gaseous molecules as physiological participants in a wide range of profound biochemical and biological functions, and have defined them as potent cytoprotective mediators in various models of tissue and cellular injury. In the physiological range, the exogenous and endogenous manipulation of these three gases has been shown to modulate ischemia/reperfusion injury, vascular damage, vasodilation, oxidative stress, inflammation, and apoptosis. In terms of cytoprotective effects, NO has been the most investigated gasotransmitter. Specifically, much of this work has focused on the role of endogenously and exogenously derived NO in mediating the effects of myocardial I/R injury [17–21]. The role of endogenously derived NO has been studied using pharmacological inhibitors against NOS and by genetically targeting each NOS. The role of exogenously derived NO has been studied through the administration of NO in the form of authentic NO gas, NO donors, and more recently nitrite and nitrate. Perhaps the most clear-cut evidence for a protective role of endogenously derived NO in the setting of myocardial injury comes from studies aimed at investigating eNOS . Studies that have employed the use of mice deficient in eNOS (eNOS-/-) have overwhelmingly shown that these mice experience exacerbated infarct sizes and increased myocardial dysfunction in response to myocardial ischemia [23–26]. In contrast, the overexpression of eNOS has been shown to reduce the size of myocardial infarction and increase myocardial function in the same experimental models of injury [27–29]. Early studies reported that a deficiency of nNOS or iNOS did not affect infarct size in response to acute myocardial ischemia [24, 28, 30–32]. However, more recent evidence suggests that nNOS plays a crucial role in preventing adverse left ventricular remodeling and ventricular arrhythmias and maintaining myocardial β-adrenergic reserve after myocardial infarction [33, 34]. Likewise, new evidence has emerged to suggest that gene transfer of iNOS affords cardioprotection against myocardial I/R injury [35, 36]. Taken together, these studies clearly demonstrate that endogenously produced NO has the ability to protect the heart from I/R injury. Extensive work has also investigated the use of NO as a viable pharmacological approach for the treatment of I/R injury. Inhaled NO gas therapy initiated just before or during coronary artery reperfusion has been shown to be an effective means to rapidly increase the accumulation of NO metabolites in blood and tissues and to provide protection against myocardial I/R injury [37, 38]. Additionally, the class of drugs known as NONOates, which release NO in a pH-dependent, first order process have repeatedly been reported to provide cardioprotection in experimental models of myocardial I/R injury [39, 40]. NONOates are not the only pharmacological agents that can provide protection by increasing the bioavailability of NO, as it has clearly been shown that statins, metformin, adiponectin, and estrogen provide cardioprotection by increasing the production of NO from eNOS [28, 29, 41–44]. The use of NO as a therapeutic agent in the treatment of myocardial I/R injury has not been without some controversy, as there have been some studies to report negative effects. In 2001 a comprehensive review investigating the role of NO in modulating myocardial injury spanning from 1991-2001 found that 73% of the studies reported that NO (endogenous or exogenous) was cardioprotective, whereas 12% reported that NO was detrimental . Further investigation of NO efficacy in myocardial I/R have suggested the cause for discrepancies between the opposing findings can be explained by dosing inconsistencies, as it is suggested that physiological levels (i.e., nanomolar) of NO promote cytoprotection, while suprapharmacological levels (i.e. high micromolar and milimolar) mediate cellular necrosis and apoptosis [17, 21]. Enhanced expression of HO-1 and its degradation products have been shown to augment multiple intracellular cytoprotective pathways. In particular, HO- 1 protein expression is significantly up-regulated in myocardial infarction , and hypoxia-induced upregulation of HO-1 in the heart has been shown to significantly increase CO production . Predictably, studies investigating myocardial damage in HO-1 knockout mice following MI have reported  exacerbated myocardial injury, increased ROS production, and decreased endogenous CO production. However, at low levels exogenous CO has been shown to stimulate cardioprotection in HO-1 knockout mice, and rat hearts during I/R . The role of endogenous CO in cardioprotection has also been demonstrated using carbon monoxide-releasing molecules (CO-RMs) to elicit pharmacological activities in myocardial cells against I/R injury . Taken together, these studies suggest the use HO-1 induced CO production and direct administration of CO provide potential therapeutic alternatives for the pharmacological regulation of myocardial I/R injury [9, 49, 50]. An increasing number of studies also provide evidence that both exogenous and endogenous H2S exert cytoprotective effects , especially against myocardial I/R injury  Studies have found that, targeted deletion and genetic manipulation of CGL leads to modification of H2S expression in the aorta, heart, and serum . Johansen first investigated exogenous pre-treatment of H2S using a Lagendorff hanging heart model, and found that H2S administration caused a reduction in infarct size and suppressed myocardial I/R injury . Similarly, in vitro studies have found that pretreatment with H2S reduces myocardial necrosis, decreases cardiomyocyte death, improves mitochondrial function  and increases myocyte contractility [56, 57]. In vivo models of myocardial I/R have provided further support suggesting the cardioprotective effects of H2S. Studies using murine models I/R injury have shown that of treatment with H2S prior to myocardial ischemia significantly reduces infarct size, and H2S administered at the time of reperfusion has been shown to reduce infarct size and exert dose dependent cardioprotection [43, 58]. However, when the production of H2S is reduced by pharmalogical inhibition prior to myocardial ischemia, mice experience exacerbated myocardial injury . Further evidence that H2S confers cardioprotection has been shown by genetically altering CGL expression. Mice deficient in CGL (CGL-/-) have been reported to experience decreased myocardial function, reduced serum H2S levels, pronounced hypertension, diminished endothelium-dependent vasodilation, and significantly larger areas of myocardial infarction compared to wild-type control animals [58–60]. However, a recent study investigating the hemodynamic effects of H2S reported that CGL-/- mice did not display a significant difference in blood pressure when compared to wild-type mice . The discrepancy between these two studies might be partly due to the genetic background of the mice used, which indicates that more research is needed to confirm the effects of CGL inhibition on blood pressure. Furthermore, specific overexpression of CGL has been shown to increase H2S production in the heart, and reduce the degree of injury following myocardial I/R . These findings suggest that therapy targeting endogenous and exogenous H2S may offer cytoprotection against myocardial I/R injury. The cytoprotective effects of gasotransmitter therapy are not limited to myocardial I/R injury, as NO and H2S have been shown to confer protection in other organ systems, such as the liver, kidney, and brain. Hepatic I/R injury is oftentimes associated with liver surgery, hepatic transplantation, and hepatic resection. NO modulates hepatocellular/tissue injury through its participation in neutrophil adhesion, platelet aggregation and maintenance of normal vascular permeability . Kuroki et al investigated the role of nitroprusside in the pathogenesis of hepatic I/R injury using a rat model, and reported that it enhances hepatic microcirculation, decreases LDH serum levels and reduces hepatocyte damage . H2S therapy has also been shown to reduce serum alanine aminotransferase (ALT) and aspartate aminotransferase (AST) levels following hepatic ischemia-reperfusion , and to inhibit lipid peroxidation as well as decrease inflammation [64, 65]. In 2007, Tripatara and colleagues used a rat model of renal I/R injury to demonstrate attenuation of renal dysfunction and injury in response to topical treatment with sodium nitrite . In addition, Unal and colleagues  have investigated the effects of nitroprusside and antioxidant vitamins C and E, using rat kidney I/R models and found that nitroprusside inhibited xanthine oxidase and provided a preventive influence in renal I/R injury than the antioxidant vitamins C+E. Tripatara and colleagues also investigated the endogenous and exogenous effects of H2S in renal I/R injury, and found that CGL inhibition causes a significant decrease in renal function and that topical H2S therapy applied to the kidney prior to ischemia improves renal function and attenuates renal I/R injury . More evidence regarding the efficacy of NO and H2S therapy has been demonstrated in models of cerebral ischemia. Chen examined the effect of eNOS production in cerebral ischemia using eNOS-/- mice . Predictably, the eNOS-/- mice displayed a significant decrease in neurological function, attenuation of angiogenesis, and decreased cell proliferation. Other studies have reported the benefits of intravenous sodium nitrite infusion at the time of reperfusion as means to restore cerebral blood flow, and decrease infarct volume [70, 71]. Furthermore, administration of the exogenous NO donor ZJM-289 has been shown to increase eNOS expression, cGMP, and NO after cerebral ischemia. Moreover, administration of H2S following cerebral ischemia has been shown to reduce infarct size, increase H2S levels in the brain and provides neuroprotection by inducing hypothermia (30.8 ± 0.7°C) . However, contrasting studies have shown H2S administration significantly increases cerebral infarct volume in rats following middle cerebral artery occlusion . A recent study has reported that the neuroprotective effects of H2S are concentration dependent , and that administration of H2S increases fetal GSH levels in the brain, decreases cerebral I/R injury and protects against oxidative stress in utero . Additionally, H2S has been shown to reduce neuronal cell death in a murine model of cardiac arrest/cardiopulmonary resuscitation . Thus, additional studies are certainly needed to address the reported discrepancies in models of cerebral injury. Exposure to CO has been shown to promote cell survival, decrease necrosis, prevent graft rejection and promote tissue protection during organ transplantation [40, 77]. Exposure of the graft donor as well as the graft (during ischemia) to exogenous CO and HO-1-derived CO has been shown to restore graft function, reduce generation of ROS and thus prevent cytotoxic tissue injury. Overexpression of HO-1 has been shown to reduce intragraft apoptosis  and suppress vascular injury. Akamatsu and colleagues used HO-1 preconditioning to demonstrate retention of functional viability in cardiomyocyte cellular grafts after implantation . Yoshida and colleagues, exposed isolated rat hearts to CO at high pressure, and reported organ preservation, attenuation of intracellular decomposition and prevention of necrosis . Other studies have demonstrated HO-1 increases survival after cardiac transplant and HO-induced CO protects tissue in mouse-to-rat cardiac transplantation . Additionally, at physiological levels CO inhalation was found to exert tissue protection in lung transplantation , and HO-1 overexpression has been shown to regulate a cascade of cytoprotective effects in immune response to organ transplantation . Currently the US food and Drug administration has granted an orphan drug safety and tolerability study for CO inhalation therapy in the reduction of delayed graft function, and solid organ transplant preservation. In summary, extensive research performed in recent years has clearly demonstrated that the efficacy of gasotransmitter therapy in ameliorating in vitro or in vivo I/R injury. 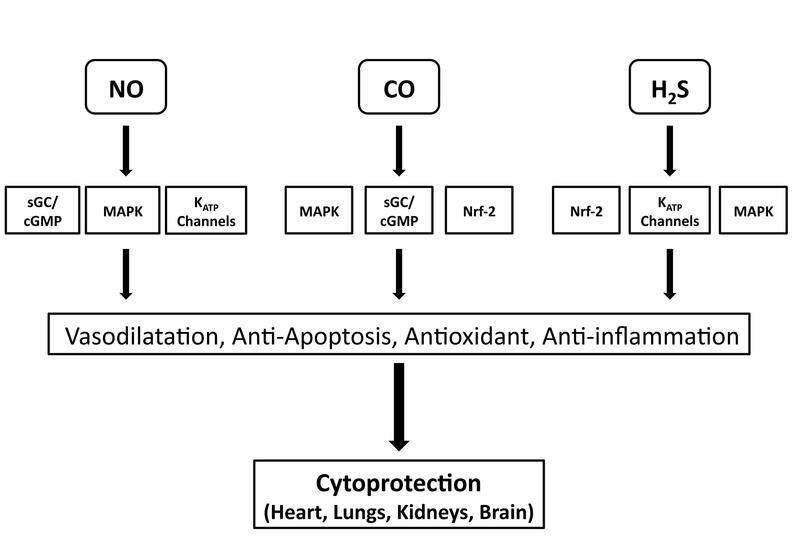 Most importantly, these studies have provided important information regarding the doses of each gas that provide cytoprotection and suggest that the use of these gases at or near the levels considered to be produced under physiological conditions in vivo is optimal to protect a number of organs including the heart, liver, kidney, and brain. So far, this review has provided evidence supporting the multifaceted role of gasotransmitters in cytoprotection and as such has highlighted the similarities between all three gases. For instance, all are naturally produced in the body and are constantly participating in biological responses within target tissues and organs . The rate of NO/CO/H2S production, cytoprotection and clearance vary with time, dose concentration, and enzymatic mediators. Even the enzymes responsible for biosynthesis of gastrotransmitters show parallel similarities and in the case of NO and CO can be classified as constitutive (eNOS, nNOS, and HO-2) or inducible (iNOS, and HO1). Importantly, all three gasotransmitters possess similar physiological actions that could account for the observed cytoprotective effects (Figure 4). For example, all three can: (1) induce vasodilatation by activating the sGC/cGMP pathway (NO and CO)  or by activating ATP-sensitive K+ (KATP) channels (H2S) ; (2) inhibit apoptosis by directly interacting with the apoptotic machinery  or by increasing the expression of anti-apoptogens, such as HSP90, HSP70, and Bcl-2 ; (3) modulate mitochondrial respiration [17, 58, 87]; (4) induce antioxidants [58, 81] and (5) inhibit inflammation [88–91]. However, while the actions are similar, there are some differences in the mechanisms by which these gasotransmitters induce these effects and the regulatory actions of the enzyme systems can vary depending upon the gas being investigated. Furthermore, there does appear to be some crosstalk between the gases, which can provide synergistic effects and additional regulatory effects. The rest of this article will provide a brief discussion on the complex interactions between the gasotransmitter systems. Summary of Mechanisms by which Gasotransmitters can Induce Cytoprotection. The gasotransmitters share unique and similar pathways by which they protect against tissue and cellular injury. Both CO and NO have been shown to regulate smooth muscle relaxation through the sGC/cGMP pathway. NO and H2S have been shown to regulate cell proliferation and vascular smooth muscle relaxation balance through mitogen-activated protein kinases (MAPK), and ATP-sensitive potassium channels (KATP ). In addition, H2S and CO regulate oxidant/antioxidant balance through the transcription factor NF-E2-related factor (Nrf2). We will begin with the interaction between NO and H2S. Like NO, H2S is produced in the endothelium as well as SMCs , and mediates acute regulation by vasorelaxative hormones through calmodulin and IP3 dependent pathways . There appears to be a close interaction between H2S and NO, with NO amplifying the inhibitory effect of H2S and H2S tissue specific activation of eNOS . In particular, NO and H2S have been suggested to collaborate in regulating vascular homeostasis and vasodilation . Additional evidence suggests that NO can increase CGL activity acutely, and that chronic exposure to NO up-regulates CGL expression. Moreover, at low concentrations H2S has been shown to enhance the release of NO from vascular endothelium and increase the vasorelaxant effect of the NO donor sodium nitroprusside . CO and NO share apparent similarities in structure, molecular weight and solubility . Both NO and CO interact with iron (Fe) to form 5 or 6 coordinated haem complexes, which result in conformational changes and activation of the sGC/cGMP pathway . Thus, many of the biological effects of CO are similar to NO, including its anti-apoptotic, anti-proliferative and anti-inflammatory mechanisms. Other studies have confirmed the participation of both NO and CO-mediated signaling cascades in immune suppression of platelet aggregation and neurotransmission . In addition to regulating vascular cell growth, CO influences cell survival by blocking cytokine-mediated mitochondrial release of cytochrome C  and has been shown to influence hepatoprotection through the transcriptional upregulation of iNOS in the liver. Both exogenously administered or endogenously released NO stimulates HO-1 gene expression and CO production [32, 97]. Furthermore, CO and NO have been shown to participate in vasoactive cross talk, influencing: growth factors, anti-inflammatory mediators, angiogenesis and vascular remodeling [98, 99]. The crosstalk between H2S and CO has been the least studied, as there are only a few studies which have addressed this interactions. Zhang and colleagues  were one of the first to investigate the physiological and pathological interactions of CO and H2S and found that exogenous H2S can upregulate the CO/HO pathway during hypoxic pulmonary hypertension. Additionally, in much the same manner to that described for NO, H2S increases the expression of HO-1 in a Nrf-2 dependent manner . The studies mentioned in this review have identified the therapeutic potential and translational opportunities of gasotransmitters as potent cytoprotective molecules. So far, the exogenous administration, endogenous manipulation and use of genetically modified animals has been successful in demonstrating gasotransmitter-mediated cytoprotection in models of I/R injury and other forms of disease. In addition, the gasotransmitters have been shown to play a pivotal role in the regulation of cell functions and in the reduction of tissue injury by activation of a number of prosurvival pathways. However, there are still a number of questions that remain to be answered, especially in relation to the interactions between the gases. For instance, the exact correlation between these gases in the various pathways of cytoprotection has yet to be fully investigated . It is also not known if using some variation of NO/CO/H2S, as a combination therapy will provide synergistic effects in the treatment of ischemic disorders. Therefore, additional studies designed to examine NO/CO/H2S cross talk will provide better comprehension concerning this issue, as well as new insights into their interactions. In addition, it is important to recognize a need for the development of consistent dosing and measurement techniques for the advancement of gasotransmitters in pharmalogical research. Because the regulation, expression and function of these gaseous molecules are so complex, optimal alterations in synthesis and activity will possibly provide novel therapeutic opportunities for the treatment of a number of pathophysiological conditions. Supported by grants from the American Diabetes Association (7-09-BS-26) and the National Institutes of Health (NIH) National Heart Lung and Blood Institute (1R01HL098481-01) to JWC. This work was also supported by funding from the Carlyle Fraser Heart Center (CFHC) of Emory University Hospital Midtown. BFM and JWC wrote the manuscript. All authors have read and approved the final manuscript.